My daughter recently not only got her braces tightened, but had rubber bands added to connect her top and bottom teeth. BOY, was her mouth sore—much more than a normal tightening, she said. 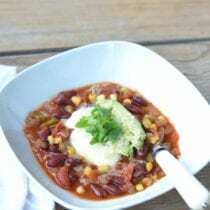 So on our tour of soft foods (including plenty of smoothies, applesauce, and soup), I made a slow cooker version of the vegetarian chili from my first cookbook that she loves and even pureed it for her with a little sour cream mixed in. It worked like a charm, so I thought I’d share this version with you as well. Enjoy! Combine all ingredients in slow cooker and cook on high for 4 to 5 hours or low for 6 to 8 hours until all ingredients are tender. Remove bay leaves and serve with recommended toppings. Dairy free if served without sour cream and cheese. I made this today and my 12 year old is on his second bowl! I think I should have made a double batch. Thanks for sharing this recipe. 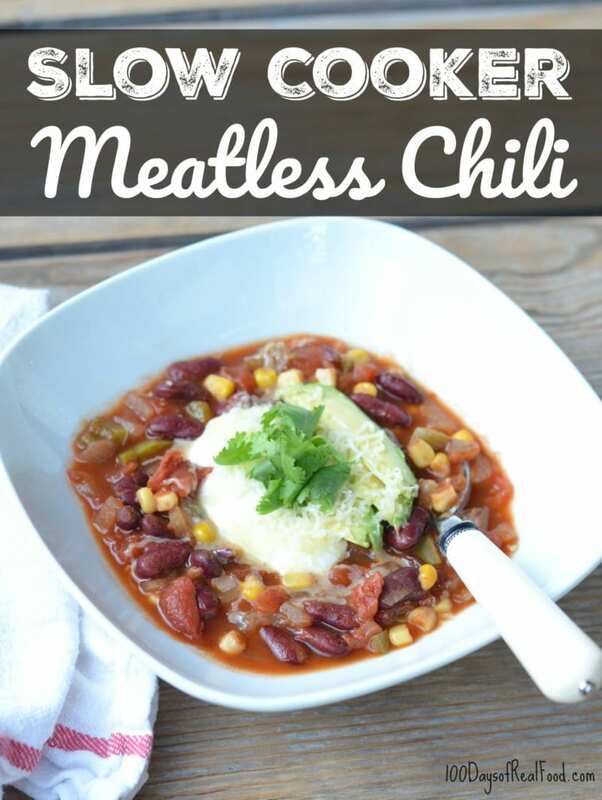 Thanks for sharing this recipe with us its sound delicious slow cooker meatless chilli but my question is that my wife is stomach cancer stage II, survivor she can eat this or not. From a recipe, its look like a healthy food but I don’t know she can take this much spice in that condition. Thanks for letting me know what I am making for dinner tonight! My 10year old is super picky about meat, hopefully this goes over well with her! I’m excited by this recipe. We eat vegan 4 days out the week and I’m always looking for flavorful ways to alter recipes. Thank you.